Obviously, any deck can answer any question. And most readers have one, sometimes two decks that they swear by -- usually the one(s) they learned to read with. Since there are so many decks on the market, it stands to reason that some may be better suited to certain kinds of questions than others. Following are some suggestions. There are no hard and fast rules. What works for one person may not work for another, so experiment and see what you come up with. I'm not going to get into a lengthy deck review on this page, just suggestions. For more detailed reviews, go to Michele's Tarot Page or Wicce's Tarot Collection. Published by US Games Inc. This tarot and the many RWS clones are excellent decks for general readings. It covers all the bases very thoroughly and is the deck of choice for many readers. 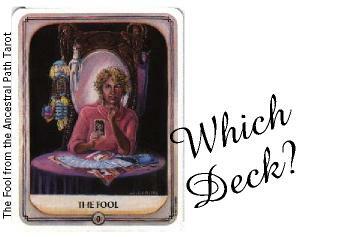 There are many variations of this deck, the Universal Waite being one of most popular with its muted colors. Other popular clones are the Hanson-Roberts, Robin Wood, Connolly, Halloween, and others. Published by US Games, Inc. This deck is a heavy hitter. If you want the straight scoop on an issue, no holds barred, use this one. I find it's sometimes a little brutal, especially for clients who aren't ready to face reality. Better to ease these people into awareness with a gentler deck. Sometimes I pull out the Thoth if another deck just isn't on the mark, or if I feel the client isn't being totally honest with me. This deck has a strong yang energy. It's very aggressive, and will often answer questions you haven't asked, ignoring what you have asked. 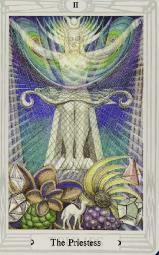 This isn't unusual when reading the tarot, but I've noticed it most often when using this deck. This deck is a gem for those relationship spreads. Where the Thoth is very yang, this deck is very yin. There is a nurturing quality to the interpretations, but it is also very honest. This deck is a feminist deck and will many times provide women with positive solutions to their problems. It is not a woman-only deck, though. I find its interpretations to be just as appropriate for men. Use this deck especially for people who have been hurt and are in need of healing and empowerment. It's like balm to a burn. I bought this deck on the recommendation of another reader for use in relationship spreads. It does seem to work quite well. The minors in this deck are scenes of four couples in varying stages of relationships, one couple per suit. 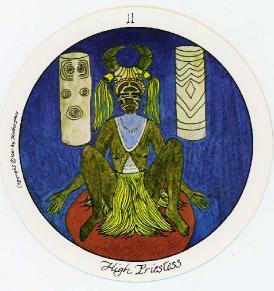 Most times, the interpretation is just as easy as describing the card. Since we get so many questions about love, this seems a sensible deck to have. Many of us on multiple lines sometimes find ourselves answering calls for Native American networks. 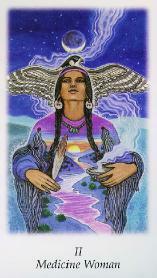 I bought the Native American Tarot just for that purpose, but then found the Vision Quest. This is a stunning deck with incredibly beautiful Native American symbology which does not require that you learn an extensive new deck system. If you read with the Waite deck, you can pick this one up with no problem. I still like the Native American deck as it seems much more authentic, much more rooted in the tradition. If you find yourself taking a lot of calls for Native American lines, I think you should study the Native American deck. If you only get a few calls a year, the Vision Quest will work wonderfully.